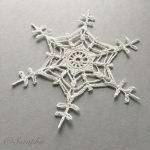 I made this Crochet Lace Star pattern when I started making my snowflake patterns. It was intended to be a snowflake, but then I got to the last round it really wanted to be a star, so I tried that. I also made it as a snowflake, but it works much better as a star, so I decided to stick with that! I make them as Christmas decorations for the Christmas tree or a bare branch decorating a table etc. You can also hang three on a string and put it in the window – they look beautiful when they catch the light. I use 3-ply and 2-ply linen yarn for making mine as linen has a lovely rustic look and holds its shape well, but any yarn can be used. 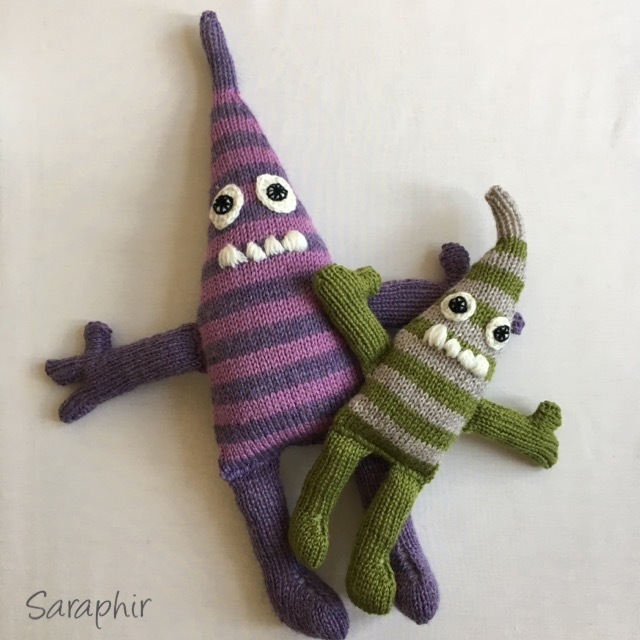 The grey one below is made with Scheepjes Catona – a 4-ply 100% cotton yarn. 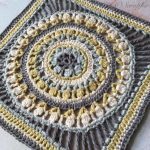 The pattern is available below in both UK and US terms. 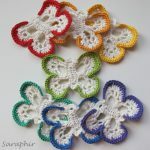 There is a brief guide to abbreviations on the page Crochet Terms. 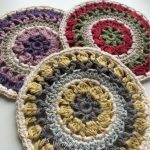 You are welcome to sell what you make with this pattern, but please credit me as the designer, or, if you sell online, post a link to my pattern. You may not sell or redistribute this pattern in any way or pass it off as your own work. Foundation chain: ch 6, ss in first ch to form a ring. Round 2: ch 3 (counts as tr), ch 5, skip 1 dc, ( 1 tr in next dc, ch 5, skip next dc) x 5, ss in 3rd ch of first ch-3. Round 3: ss in ch-5, ch 1, work in same ch5sp: (1 htr, 1 tr, ch 2, 1 tr, 1 htr, 1 dc) *1 dc in next tr, work in ch5sp: (1 dc, 1 htr, 1 tr, ch 2, 1 tr, 1 htr, 1 dc) *, repeat from * to * 4 more times, 1 dc in ss (last ss of round 2), ss in 1st ch. Round 4: ss in 1 htr, 1 tr and ch2sp, ch 3, work in same ch-2 sp: (2 tr, ch 3, 3 tr), * ch 3, work in ch2sp: (3 tr, ch 3, 3 tr)*, repeat from * to * 5 more times, ch 3, ss in 3rd ch of 1st ch-3. Round 5: ss in 2 tr and ch-3 sp, ch 4, work in same ch3sp: (3 dtr, ch 4, 4 dtr) in ch3sp, * ch 3, 1 dc in ch3sp (from R4), ch 3, (4 dtr, ch 4, 4 dtr)*, repeat from * to * 5 more times, ch 3, 1 dc in ch3sp, ch 3, ss in 4th ch of 1st ch-4. Round 6: ch 1, 1 dc in next 2 st, 1 htr in next st, work in ch-4 sp: (2 tr, 2 dtr, ch 3, ss in 3rd ch from hook, 2 dtr, 2 tr), 1 htr in next st, 1 dc in next 3 st, * 3 dc in ch3sp, skip 1 dc, 3 dc in ch3sp, 1 dc in next 3 st, 1 htr in next st, work in ch4sp: (2 tr, 2 dtr, ch 3, ss in 3rd ch from hook, 2 dtr, 2 tr), 1 htr in next st, 1 dc in next 3 st *, repeat from * to * 4 more times, 3 dc in ch3sp, skip 1 dc, 3 dc in ch-3 sp, ss in 1st ch. Fasten off, sew in ends, block and enjoy! Round 2: ch 3 (counts as dc), ch 5, skip 1 sc, ( 1 dc in next sc, ch 5, skip next sc) x 5, ss in 3rd ch of first ch-3. Round 3: ss in ch-5, ch 1, work in same ch5sp: (1 hdc, 1 dc, ch 2, 1 dc, 1 hdc, 1 sc) *1 sc in next dc, work in ch5sp: (1 sc, 1 hdc, 1 dc, ch 2, 1 dc, 1 hdc, 1 sc) *, repeat from * to * 4 more times, 1 sc in ss (last ss of round 2), ss in 1st ch. Round 4: ss in 1 hdc, 1 dc and ch2sp, ch 3, work in same ch2sp: (2 dc, ch 3, 3 dc), * ch 3, work in ch2sp: (3 dc, ch 3, 3 dc)*, repeat from * to * 5 more times, ch 3, ss in 3rd ch of 1st ch-3. Round 5: ss in 2 dc and ch3sp, ch 4, work in same ch-3 sp: (3 tr, ch 4, 4 tr) in ch3sp, * ch 3, 1 sc in ch3sp (from R4), ch 3, (4 tr, ch 4, 4 tr)*, repeat from * to * 5 more times, ch 3, 1 sc in ch3sp, ch 3, ss in 4th ch of 1st ch-4. Round 6: ch 1, 1 sc in next 2 st, 1 hdc in next st, work in ch4sp: (2 dc, 2 tr, ch 3, ss in 3rd ch from hook, 2 tr, 2 dc), 1 hdc in next st, 1 sc in next 3 st, * 3 sc in ch3sp, skip 1 sc, 3 sc in ch3sp, 1 sc in next 3 st, 1 hdc in next st, work in ch4sp: (2 dc, 2 tr, ch 3, ss in 3rd ch from hook, 2 tr, 2 dc), 1 hdc in next st, 1 sc in next 3 st *, repeat from * to * 4 more times, 3 sc in ch3sp, skip 1 sc, 3 sc in ch-3 sp, ss in 1st ch. Fasten off, sew in ends, block and enjoy! 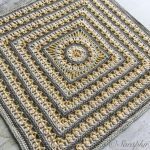 I hope you enjoy the pattern and have fun making! I would love to see your versions of the star, so please tag me @saraphir on Instagram or share to my Facebook page. 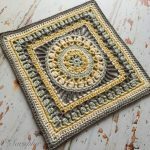 Developing all the patterns and maintaining a blog takes time and money, so if you enjoy the patterns please consider making a small donation towards the cost. 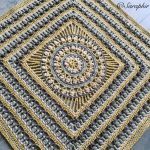 Thankyou very much for sharing this pattern. As a beginner i was able to follow the pattern well with the pictures and produce a nice peice at the end of it.